Glas 1700 GT: What color? 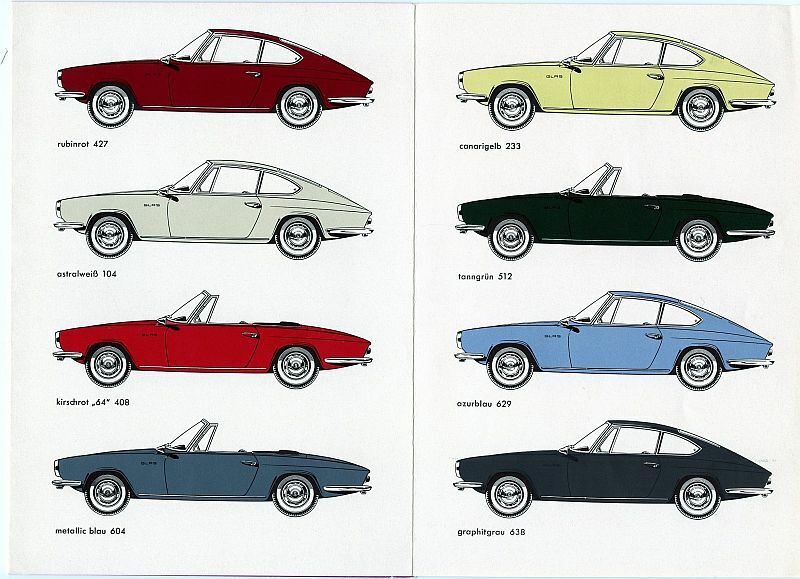 I got these color charts in an email from Sascha in Germany who has a 1700 GT. Now that I have the original palette to choose from, I am rethinking the color I should paint the car. It needs a lot of body work so a light color would be best. It looks to have originally been white and later repainted to red. I’m not interested in red, having had a number of red cars over the years. I like the idea of white, but my cousins GT is white. I go on about light blue and gray Alfa’s, maybe this is my chance to paint something one of those. I have alternately decided on light gold, metallic dark dray and metallic light blue, so maybe I should settle on one of those. Tough decision. What do you think? Post a comment with the color from the charts below you would paint a Glas GT if you were about to paint one. Perlgrau and Aquamarin are pretty sweet. I like the astral white, metallic blue and graphite gray. 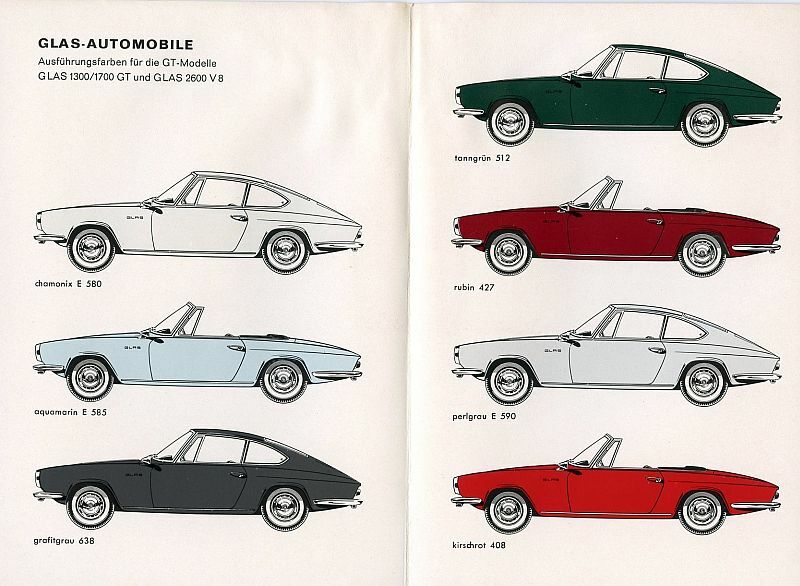 Did Alfa do a Giulietta color chart like this with cars in silhouette? 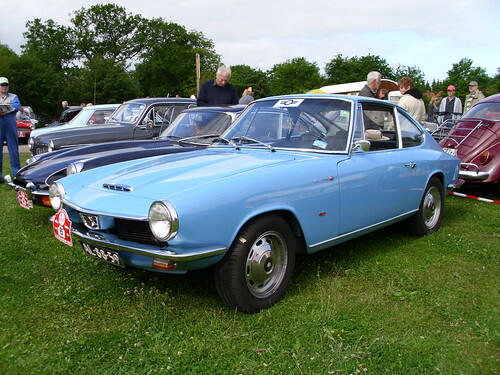 This entry was posted in Glas 1700 GT and tagged glas 1700 gt, Italian cars, Project cars by Hamilton. Bookmark the permalink. Agree with your preferences. Kind of like the metallic blue. I like the metallic blue as well, but a friend (in the 70s) had the629 blue, and it looked great on that car. Pearl gray will be essentially silver- while it’s a “safe” color, it’s also great for the surface vocabulary of this car. Metallic blue will achieve the same, with darker overall value and more actiev reflections. More angular than a 911, but with subtle surface transitions and plenty of tension in the overall gesture. You may be able to find a paint supply place that has a database for obscure makes, even this. Hey, my favourite would be light blue. Canarigelb 233 is also a nice color for the GT. I prefer the Canary Yellow; it seems to be a light yellow/cream on the palette, which I think fits an understated car like this perfectly – keeps the whole feeling “light”. We come across lots of light-blue, grey, and white classic cars, so I’d do something different here to help the car stand out. The recently-sold Stanguellini was also light-yellow/cream, and it was beautiful. The metallic blue reminds me of the early 911 series non-metallic Aga Blue. Would look pretty elegant. Good luck with the decision as it will not be an easy one. i’ll put in my 2 cents worth; i vote for 604 metallic blue as it is a gun metal blue that has grey in it with a splash of cream which combined gives you an elegant and a color that stands above robins egg blue. Most of the suggestions tend to reflect not so current color schemes. The car has pleasant lines and would be terrific in an not so common color scheme. Take a chance, Take a serious look at the light green. It would show off the car very well. Finding modern equivalents to your Glass colors is partly hard, partly easy. Locate a Ditzler “Foreign Car Colors” paint manual (mine is 1963, has Goggomobile, but not Glas). That’s the hard part. Then, with the Ditzler code from the manual for the Glas color you want, Ditzler will mix paint to the best approximate color, using modern paints, to the original Glas colors. Order several quarts of different colors, spray them on some large sheets of metal, and choose what you like best from the samples. This is the easy part. I did this on my 1958 Jaguar XK150 roadster, sprayed a half dozen colors before settling on Claret with red interior. Way too many people have said it’s hard to get paint in colors of the 1950s and 1960s, so everyone seeminly believes it. Not so, but you need the Ditzler code. Perhaps Ditzler also has the codes, I’ve never checked because I had the Jag paint and leather manual, which combined with the Ditzler manual, gave me exactly what I wanted. You have the Glas manual, now all you need is the corresponding Ditzler codes. Incidentally, this would also work with Alfa, I’ve not need to paint mine. Do it authentically and do it right. Thanks for the tips. To do it authentically and right I should do it the original Astral white -which I kind of like. I like the aquamarin, as long as you dont veer off towards a french blue. Needs to be like a Giulietta light blue. If I was going off the pallet for this car, a Lancia pewter grey might look nice and understated. They are so much like 911s perhaps you should look at their color choices? I thought about pewter gray. I’m not a fan of the medium/light blue -that’s the color of my parts car and all I can say about it is ‘meh’. I’ll check out 911 colors. Sounds weird, but I think a light metallic champagne gold would look really good. Astral white fits perfect on your car! These cars were available in such amazing colors back in the day. It would be a shame to paint it the same old white/gray/silver that’s on 80% of the new cars today. Talk about getting lost in a crowd. Make it stand out – as long as it’s not red. I d go with the original factory delivered color combination! So the original white! Bigger, more professional paintshops are able to scan a piece of a piece of original paint left on Your car and mix the new paint for Your car to that original shade! Is the gt already finished…?